(s) Before January 1, 2015, by majority vote of the members of the county board of commissioners elected and serving in a county with an appointed board of county road commissioners, pass a resolution that transfers the powers, duties, and functions that are otherwise provided by law for the appointed board of county road commissioners of that county to the county board of commissioners. So at their Oct. 2, 2013 meeting, Washtenaw County commissioners created a seven-member subcommittee to “explore partnerships and organizational interactions with the Washtenaw County Road Commission.” A March 31, 2014 deadline was given for the subcommittee to deliver its recommendations. Members included four county commissioners: Alicia Ping of Saline (R-District 3), Conan Smith of Ann Arbor (D-District 9), Dan Smith of Northfield Township (R-District 2) and Rolland Sizemore Jr. of Ypsilanti Township (D-District 5). Also appointed were three township supervisors: Mandy Grewal of Pittsfield Township, Ken Schwartz of Superior Township and Pat Kelly of Dexter Township. Grewal subsequently withdrew and was replaced by York Township supervisor John Stanowski. Ping served as the subcommittee’s chair. The subcommittee meetings were open to the public, and were attended by various township officials and road commission staff. The March 1 meeting was the longest, lasting about 2.5 hours as the group developed its recommendations. According to Ping, it was likely the last subcommittee meeting, unless the county board gives further direction for additional work. Government leaders need to make decisions for the long-term future, Posegay said, and not make shortsighted decisions that hurt the public that they’re supposed to protect. Government leadership is supposed to support the public, whether it’s popular or not, and shouldn’t support their own special interests. He was suspicious about adding two more people to the three-member road commission board – it looked like it was more about control, and not a solution to problems. Steve Hubbard, who lives in Augusta Township, told the subcommittee that he works for the road commission as a truck driver on the night crew. Most of the people he’s talked to at the road commission feel that the current road commission board is doing a good job. Adding two more members would add more confusion, he said. Regarding the possibility of merging operations with the county, he said he’s read the letters from local townships that oppose a merger. Those are pretty smart people who’ve investigated it, he said, so “you should probably heed what they ask you to do.” Making changes would upset the apple cart, he concluded. Dan Smith (R-District 2) said that from his perspective, the reason that the subcommittee was created is because of state law, which expires at the end of 2014. He said he hasn’t been advocating for either option, but he’s heard a lot of thoughts on the issue and knows what direction he’s headed. But the county is looking into it because the board needs to make a decision before the state law sunsets, he stressed. “I don’t think it would be fair to the residents of Washtenaw County to get through 2014 and not have looked into this when we had the opportunity,” Smith said. That doesn’t mean they’ll make changes, he noted – it’s possible that the county board will ultimately decide to maintain the status quo, and he’d be fine with that. Alicia Ping (R-District 3), who is chairing the subcommittee, echoed Smith’s comments. They’ve heard from almost every township in the county, she said, and it’s been good to get the feedback. It’s been a very informative process, she said. The March 1 meeting packet included letters from four township supervisors: Gene DeRossett of Manchester Township; Spaulding Clark of Scio Township; Peter Psarouthakis of Sharon Township; and Jim Marion of Saline Township. Each letter conveyed that the respective township boards had voted in opposition of the county taking control of the road commission. During the meeting, Pat Kelly – the Dexter Township supervisor who serves on the subcommittee – reported that Dexter Township’s board of trustees had passed a similar resolution. She’d heard from several other townships that had either passed resolutions or were planning to do that. Another subcommittee member – York Township supervisor John Stanowski – said that York Township’s board also passed a resolution that supported leaving the road commission unchanged. 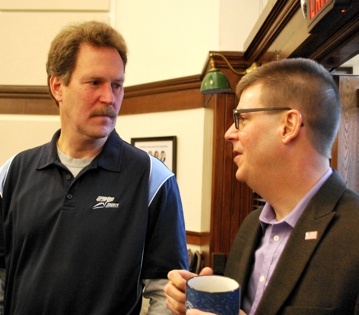 From left: Roy Townsend, managing director of the Washtenaw County road commission, and county commissioner Dan Smith (R-District 2) at the March 1 meeting of a subcommittee looking at the future of the road commission. Conan Smith (D-District 9) confirmed with Dill that a lot of collaborative work that could be done between the road commission and the county doesn’t necessarily depend on consolidating operations between the two entities. Dill replied that he and Roy Townsend, the road commission’s managing director, have had a few conversations about opportunities to collaborate and partner. Those discussions will continue, Dill said, regardless of the subcommittee’s recommendations and ultimate county board vote. Ken Schwartz, Superior Township’s supervisor, said he had hoped to see an analysis of the existing fleet – an inventory, condition of the current fleet, and replacement costs to get the fleet and equipment up to modern standards. Townsend replied that the estimated cost to upgrade the fleet’s heavy trucks alone would be in the $12-15 million range. This year, the winter has taken a toll, Townsend added, because trucks that are 10-15 years old are being used non-stop. At the start of the winter, the fleet had 53 trucks. Now, it’s down to 38. “It’s like taking an old car back and forth to Florida six times,” Townsend said. New trucks are more efficient, he added – it’s possible to do one pass with a lot more coverage than with the older trucks. So it does save costs, he said. Dan Smith (R-District 2) clarified with Dill that the county does not have a similar operation to the road commission – in terms of heavy trucks and a maintenance yard, for example. That’s true, Dill said. There’s no heavy equipment in the county’s fleet. Primarily, the county’s fleet includes passenger vans, a few pickup trucks, and other vehicles. He added that right now, an assessment of the county’s fleet operations is underway, and they’re looking at a new service delivery model. But the county does not manage a fleet that’s like the road commission’s, Dill said. In response to a query from Alicia Ping (R-District 3), Dill said that the county contracts out for its vehicle maintenance, and it would be possible to contract with the road commission for maintenance work. Ping encouraged Dill to explore that option. Townsend noted that the road commission’s maintenance is focused on heavy trucks, and that it also contracts out to private businesses for lighter vehicle maintenance. Schwartz said his point is that the fleet would be a potential liability to the county, if it absorbed the road commission’s operations. Regarding Heidt’s report on human resources, Ping said she was surprised by the results. Conan Smith said he hadn’t been surprised that there were a lot of efficiencies already between the county and the road commission. None of the motivations behind this subcommittee’s work are related to inefficiencies or ineffectiveness at all, he said, adding that he was pleased to see the staff reports validate this. Dan Smith agreed, saying the current exploration isn’t about just saving a few dollars. The road commission does an extraordinary job with the available resources and difficult circumstances, especially this winter, he said. The subcommittee’s work is about the state law, he noted, and due diligence in making a decision. The original March 1 agenda listed three options to consider as a recommendation to the county board: (1) maintain status quo, with no changes to the road commission; (2) combine the road commission into the county’s operations, with oversight by the county board of commissioners; and (3) maintain the road commission as a separate entity, but expand the number of members on the road commission board. Conan Smith (D-District 9) proposed adding two more options. One was the possibility of having an elected road commission board. [The current three-member road commission board is appointed by the county board of commissioners.] He thought it would address the issue of direct accountability to the taxpayers. Another option he proposed would be to create a separate subcommittee of the county board related to Act 283, which is way to raise more funding for roads. Alicia Ping (R-District 3) suggested that funding sources – such as Act 283– should be a separate item for discussion, because the need for additional revenue relates to any option that might be pursued. To recommend that the powers and duties of the Washtenaw County road commission would not be transferred to the county board of commissioners. John Stanowski supported the motion. The subcommittee’s purpose was to explore the possibilities provided by state law. The county would have been remiss not to do that, he said. Stanowski said he’s talked to many people, including several township supervisors, and all are in support of keeping the road commission as a separate entity. That view is based on the personal relationships that people have with the road commission board and staff, he noted. “It’s a real strong and personal bond,” he said, and people fear that bond would be lost if it were absorbed into the county. He’d looked at a report about Jackson County’s decision to absorb its road commission, but noted that Jackson County is quite different from Washtenaw County – in terms of educational status, social status, and different economic interests. He was happy to read the reports from Washtenaw County staff, which found that there would be no efficiencies gained from a merger. That led him to believe the road commission should remain independent, Stanowski said. Other issues, like expanding the road commission board’s membership, can be done at any time, he noted, and might be explored in order to improve the transparency of the road commission. Dan Smith (R-District 2) supported the motion, but said he didn’t strongly support it. He’s struggled with the issue – but not because of the competence of the road commission or interest in controlling it. As an elected official talking to constituents, he noted that the main thing people care about are the roads. He said he can deal with the confusion of the public – not understanding that the county board has limited control over roads – and said that’s not a reason to consolidate. But it’s an example of what happens when there are two countywide entities that in many respects are similar, he said, even though the road commission provides specialized services. Dan Smith noted that the county has very large population centers in the cities of Ann Arbor and Ypsilanti. As a result, the nine-member board of commissioners has four commissioners who primarily represent cities that handle their own street maintenance, and five commissioners primarily representing non-cities that have roads overseen by the county road commission. That makes it difficult to see how consolidation could provide any real benefits to township residents, he said. 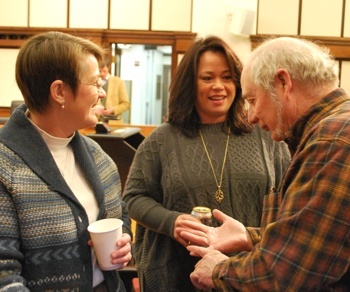 County commissioner Conan Smith of Ann Arbor (D-District 9) at the subcommittee’s Jan. 22, 2014 meeting. In the background is Roy Townsend, managing director of the road commission. Conan Smith weighed in, saying he had almost a polar opposite perspective from Dan Smith. He opposed the resolution, saying it’s probably because he represents a city district – as one of the Ann Arbor commissioners. The city has a tax base of about $4 billion, and if the city wants to take care of its roads, it can, he said. [Pat Kelly quipped, "I wish you would take care of them more."] The city has the ability to get revenues from its millage to fund street maintenance, he said. That’s different from rural communities, which have a much lower tax base. As an example, C. Smith cited North Territorial Road, which runs through several small communities that have a limited tax base. “That becomes a very complicated situation,” Smith said, because the road commission doesn’t have its own taxing authority and relies primarily on state revenue, which is declining. Even if a township levies a tax for additional road repair revenue, it becomes a significant burden on that community. The support he hears for the road commission from township officials is that the officials are very comfortable with the “localized relationship they have with their road network.” But 10 or 20 years from now, that could be a problem, he said, because the funding stream is insufficient today and is in constant decline. Although he rarely travels on North Territorial, Smith said he cares about its condition because it provides access to some of the most beautiful places in the county. He noted that he got married at Independence Lake, and many people reach the lake by using North Territorial Road. By maintaining the separateness and political divisions of the road commission and county board, it locks in place a system that has insufficient funds for roads, Smith said. That’s why he wants to do something different. Pat Kelly was curious why Conan Smith thought that absorbing the duties of the road commission would improve the revenue challenges. She wondered if it was because he thought that a countywide millage would be the only way to raise additional revenue. Smith said he didn’t think a countywide millage was the only way to raise revenue, but “it’s our best and most direct way to raise revenue via the county as a whole.” The road network is the entire county’s problem, he said, and it’s not fair or appropriate for each community to handle their piece. He noted that especially in the western part of the county, a lot of land is public land for parks and recreation, so it’s not on the tax rolls. A countywide millage would be a comprehensive solution. The townships also provide city residents with a “playground,” she said, in terms of parks and natural areas. So it’s a countywide problem. It’s possible to pass a countywide millage, Kelly said, if people understand all the factors and work together. Conan Smith elaborated on what he sees as the political challenge. The road commission doesn’t have control over streets in Ann Arbor. So if he advocates for a tax to fund roads outside the city, and his constituents are looking at the poor condition of city streets, “I’m going to get hammered, right?” He told Kelly that he understood her perspective and supported it, but was trying to figure out how to tackle the political reality. If a constituent asks how a countywide millage will be allocated, Conan Smith said, he’d have to respond by saying that the county board appoints road commissioners for six-year terms, and that there’s no control or influence over what the road commission board does. “I don’t think I can make a strong case to a resident in Ann Arbor,” he said. Kelly replied that she had the same concerns that Smith voiced, in terms of how revenues from a countywide millage would be allocated. She’d expect that the cities would share some of the money, and that it’s possible to figure out an equitable way to do it. She didn’t see how it affected whether or not to consolidate the road commission with the county. Conan Smith said he didn’t think consolidation was the only answer, but he thought it was the most direct way to vest authority and accountability with an entity – the county board, as an elected body – that looked at the interests of the entire county, including the cities. John Stanowski asked Smith whether he would vote to put a countywide millage on the ballot, even if 90% of his Ann Arbor constituents didn’t want it. “Are you saying that you’d disregard the wants and wishes of your constituents, and vote for the millage anyway?” Stanowski asked. Smith indicated that he would. Stanowski described most people as “pocketbook voters,” who wouldn’t support anything that costs them money. He wasn’t sure voters in the city would support a countywide millage for roads. He noted that if the road commission were absorbed into the county, then the townships wouldn’t have adequate representation over road funding. He didn’t see consolidation as beneficial to the townships at all. 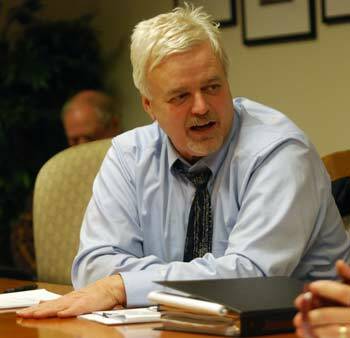 Roy Townsend, the road commission’s managing director, said that if there were to be a countywide road millage, “everyone would get their slice of the pie.” The county board could approve a list of projects proposed by the road commission, which could include joint projects within the city jurisdictions. In terms of control, he noted that the county would collect the millage and release the money to pay for a project after the project is done. Responding to some of Conan Smith’s remarks, Dan Smith said he didn’t feel it was appropriate for individual townships to bear responsibility for maintaining major thoroughfares like North Territorial Road, Geddes Road, Pontiac Trail and others. But under the current system, he noted, that’s the only option. Most people don’t really care about the organization of the road commission or political questions involved, Dan Smith said – it’s insider baseball. They care about getting the roads fixed. The current structure is a bit of an historical artifact, Dan Smith observed. The board of road commissioners actually predates the board of commissioners. A century ago there were countywide elected officials like the sheriff and clerk, but the board of commissioners didn’t exist. Instead, there was a board of supervisors, which was heavily skewed toward the townships. Each of the 20 township supervisors sat on the board, and the cities got two representatives. The board of supervisors created the road commission in order to handle these cross-jurisdictional road issues. County government provides a wide variety of specialized services, Dan Smith noted. If the county were to absorb the road commission, his assumption would be that the operations of the road commission would remain unchanged – employees would do the same things they currently do, he said. Townships used to have more responsibility for the roads, Dan Smith added, but over the years that responsibility was taken away from them by the state. There didn’t used to be statewide funding sources for roads, from gas taxes and vehicle registration fees. Rather, the townships levied taxes to pay for roads under Act 51 or through a county levy under Act 283. Dan Smith said he’s not interested in absorbing the road commission, but he thought the historical perspective was interesting. Kelly noted that the tensions between the cities and townships aren’t going away. Ann Arbor isn’t getting smaller, and townships aren’t going to overtake the city in population anytime soon. Solutions are coming in a grassroots way, she noted. Township subdivisions are agreeing to special assessment districts (SADs) as one approach to maintain roads. Scio Township is taking the lead on this, she added. 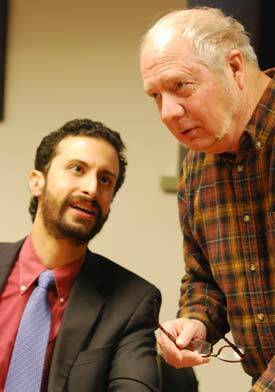 At the subcommittee’s Jan. 22, 2014 meeting, county board chair Yousef Rabhi (D-District 8) talked with road commission board chair Doug Fuller (standing). Kelly supported having a subcommittee of the county board to work on these issues, similar to a police services steering committee that’s already in place. Public safety is another example of an issue with tension between townships and cities, she said. The interests of cities and townships are different and the tax structures are different – that’s not changing, Kelly said, and it won’t be changed in any way if the road commission is absorbed into the county. Ping agreed that there are various ways to fund roads, including bonds or a millage, which she preferred. She noted that Saline Township worked closely with the road commission in deciding how to spend the money raised from a township road millage. That kind of collaboration is important. Ken Schwartz pointed out that the current subcommittee was formed because of “inexcusable neglect from Lansing. That is the fundamental problem.” The legislature and governor haven’t solved the funding problems for Michigan roads. There’s a cobbled-together system that doesn’t work, he said. Until things change at the state level, Schwartz didn’t think that much could be done besides having the road commission take care of the county’s primary roads and as many local roads as it can. Local communities must educate their residents about the need to pay for the local roads until there are major changes in Lansing. Schwartz supported the recommendation not to absorb the road commission into the county. The state has the best tools to solve this problem, Conan Smith said, but the state legislature won’t do it. The second-best tools are at the county level, he added. “We have the opportunity to grab those tools and start doing something with them.” A countywide millage isn’t optimal, but it’s a powerful tool if used appropriately. That’s why he’d be voting no on the proposed recommendation. Outcome: The recommendation not to consolidate the road commission into the county was approved on a 5-1 vote, over dissent from Conan Smith (D-District 9). Supporting the recommendation were Alicia Ping (R-District 3), Dan Smith (R-District 2), Dexter Township supervisor Pat Kelly, Superior Township supervisor Ken Schwartz, and York Township supervisor John Stanowski. Rolland Sizemore Jr. (D-District 5) was absent. Consideration of Options: Expanded Commission? The subcommittee then considered a motion put forward by Conan Smith: A recommendation to expand the road commission board from three to five members. Smith said he didn’t see it as being dramatically better, but he noted that with only three road commissioners now, if any two of them talk about the road commission’s business, then it’s a violation of the state’s Open Meetings Act. He thought there should be five road commissioners, just to avoid that challenge. Pat Kelly agreed. She likes the current road commissioners – better than any other board in the past decade or so. “But I’ve been around when I didn’t like the road commission so much, either,” she added. There were times when she felt that road commissioners weren’t representing the best interests of her township. She didn’t think the cost of expansion would be great. Stanowski said he was painfully aware of the OMA and how easy it would be to cross the line with just three members. He assumed that road commissioners discussed their business only at public meetings. Dan Smith said it would be possible to put in place a selection process like Stanowski has proposed. But it would exist only as long as the county board of commissioners chose to keep it that way, he noted. State law doesn’t require that road commissioners be appointed by district – it would be possible for the county board to appoint road commissioners who were all residents of Ann Arbor, for example. So that’s a concern, he said. Dan Smith also said he understood the OMA concerns, and for that reason alone he was interested in discussing expansion to five members. State law only allows for the options of three or five members, he noted. He said he had a host of concerns related to politics, not policy, but he didn’t want to enumerate those concerns now. Alicia Ping said she struggled with this issue. Expansion makes sense, she said, for all the reasons that had been stated. But leaving the appointments up to the county board opens the door for a lot of politics, she noted. There’s no guarantee that the appointments will be made in the best interests of the people served by the road commission, she said. Sometimes in the past, the decisions have been made based on political favors. Even so, she was inclined to support expansion. Ping ventured that because of Fred Veigel’s ill health, the timing on this issue of expansion might not be the best. Since it was likely that he would be unable to fulfill his full term on the road commission board, the county board would be appointing a replacement. [Veigel died the following day, March 2.] So in light of that, Ping thought the issue of expansion should probably be pushed back. Ken Schwartz agreed. Although the topic has been in the background as a possibility, he said, he hadn’t really given it much serious thought and wasn’t ready to discuss it. Kelly thought “there’s a lot more meat on the bone for discussion” and she’d be in favor of deferring action. At the county board’s request, she said she’d be happy to continue discussing it and to come up with a recommendation. Dan Smith asked Conan Smith if he’d be willing to withdraw his original motion. Then the subcommittee could make a recommendation to the county board to continue the discussion, he said. Conan Smith replied that he didn’t really care, but he’d be happy to withdraw the motion if other subcommittee members wanted to have more discussion at a later date. Outcome: Conan Smith withdrew his motion. Kelly then moved to recommend that the county board direct the road commission subcommittee to continue meeting for up to six months and to provide a recommendation on the possible expansion of the road commission board. Conan Smith said he’d oppose the motion. Based on his experience, the issue of expansion is just a political conversation among county commissioners. “I honestly don’t think any conversation [by the subcommittee] would inform the board’s conversation,” he said. Dan Smith noted that the county board doesn’t have to act on the recommendation to continue the subcommittee’s work. Ping said she’d support this motion, but added that she wouldn’t support continuing the subcommittee’s work when the issue came up for a vote at the county board. Dan Smith agreed, saying it was a largely political discussion that the county commissioners should have. Outcome: With six subcommittee members present, the vote was 3-3 – so the recommendation didn’t pass. Supporting the recommendation to continue the subcommittee’s exploration of expansion were Alicia Ping, Dan Smith and Pat Kelly. Voting against it were Conan Smith, John Stanowski and Ken Schwartz. Conan Smith said he didn’t support an elected road commission. It’s a heavily Democratic county, he noted. Even though road commissioners would be elected in the November general election, the real decisions would be made during the August primaries, he said. And that means that urban residents would be, for all practical purposes, making the decisions, because that’s where the highest concentration of Democrats are. He didn’t think it was the right answer to have road commissioners elected by urban Democrats to be handling decisions about roads in rural communities. Conan Smith then made a motion to recommend that the road commissioners should not be elected positions. Outcome: The motion was passed unanimously. The subcommittee also discussed possible funding sources, as a separate agenda item. The discussion focused on two primary options: A countywide voter-approved millage, or a levy by the county board under Act 283 of 1909. By way of brief background, Act 283 requires the road commission to submit a plan of recommended road repairs and the cost to do the projects. The law allows the county board to levy a millage to cover those costs, without voter approval. [.pdf of relevant section from Act 283, including summary by Lew Kidder of Scio Township.] Because the law is more than a century old and pre-dates the state’s Headlee amendment, there’s some uncertainty about the ability of county governments to use it. Ken Schwartz recalled that after he was appointed road commissioner, he worked with Roy Townsend – who was then director of engineering – to explore options provided by Act 283. At first glance, he said, he thought it was a good idea. But he’s since changed his mind. Superior Township supervisor Ken Schwartz at the subcommittee’s Jan. 22, 2014 meeting. Act 283 pre-dated the state law that allowed road commissions to be created. Schwartz argued that levying a countywide millage for roads under Act 283 flies in the face of the state constitution’s home rule provisions. He gave the example of the city of Ypsilanti, which already has a bond for roads and an excise tax on water bills for roads. He could envision Ypsilanti accepting Act 283 revenues but then using those revenues to pay for other things instead of roads, like debt on the city’s Water Street property. He didn’t see how the county could force the city to use Act 283 revenues for roads – it would have to be more like a “gentleman’s agreement,” he said. Act 283 was passed when townships were the main form of government, Schwartz noted, and the funding mechanism was simple. Now, with Act 51, road funding has become much more complex. There’s a divide between the townships and the cities, he said. How do you ensure that the cities will use the money for the purposes it was intended? “I’m not really sure that we would have the legal authority to do that,” Schwartz said. Conan Smith said his understanding was that a levy under Act 283 would be made by the county, and the revenues would be allocated by the county board of commissioners. “So why would Ypsilanti have any say over that?” he asked. The money would be awarded for projects, Smith said, not handed over to communities. He envisioned the road commission developing a list of road projects that could be funded through a countywide levy. The county board would decide what the levy would be to cover those projects on an annual basis. Schwartz replied that he thought it was too complicated for the average citizen to understand. He noted that the county has no jurisdiction over the cities, which maintain their own roads. Conan Smith described a scenario that would include city projects. For example, the Michigan Dept. of Transportation will be doing a major reconstruction of Huron Street in Ann Arbor. Revenues from Act 283 could be used as a match to make sure the project gets done, he said. Schwartz then gave the example of Ypsilanti Township, which has bonded for road repair and also used money from its general fund. Its roads are 95% done, he said, so how would an Act 283 levy benefit that township? It’s unworkable, he contended. The bottom line is that this is a problem Lansing needs to fix, Schwartz said. Dan Smith said he had some serious concerns about using the Act 283 mechanism, similar to concerns he had regarding Act 88. [Washtenaw County government levies Act 88 to fund agricultural and economic development activities. The law also pre-dates Headlee and is levied without voter approval.] Dan Smith was also uncomfortable with the process that’s spelled out under Act 283, which makes it difficult to get money into city projects. He noted that the county board has recently “stuck its toe into the road funding arena” for the first time through a mechanism that’s difficult to replicate in other parts of the county. [He was referring to the county's participation in the Pittsfield Township State Road corridor improvement authority.] The county also has relatively new authority, granted by the state a few years ago, to spend general fund tax dollars on roads. That’s another area to explore, he said. Dan Smith supported exploring a countywide voter-approved millage for roads, rather than an Act 283 levy. The challenge with a countywide millage vote is that right now, he said, Ann Arbor property owners already pay a street millage. There are still needs within the city, Townsend added, but trying to convince voters to support a countywide millage would be difficult. There was legislation in Lansing that would have allowed a countywide vote to exclude the cities, he noted, but it didn’t get any traction. Under Act 283, the county board could levy a tax annually to cover specific projects, he said, rather than doing a countywide vote. Regarding Ann Arbor’s 2 mill levy for streets, Dan Smith said that the Ann Arbor city council could choose to levy less than the 2 mills – assuming that the city could get revenue from a countywide road millage. So that would be an option for the council to decide. Schwartz said that Dan Smith had a point, but the consequence is that you’d be setting up political arguments within cities about whether to decrease the existing levy. “I don’t think the county should be proposing a levy that will create political arguments within communities,” Schwartz said. 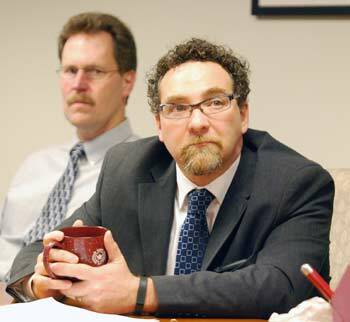 The need for road repair will be immediate, Schwartz said – as soon as the snow recedes. He suggested that if the county board wanted to levy a millage under Act 283, they should do it soon and supply the extra money to all communities for asphalt, gravel, limestone and labor. When he’d looked at it a few years ago, Schwartz said, he and Townsend had used the county’s equalization report to come up with allocations for each community. But it would likely create political squabbles within communities, he said, because of the archaic way the law is set up. Alicia Ping pointed to the Washtenaw Urban County as an example of communities working together to allocate funding – in that case, federal dollars from the community development block grant (CDBG), HOME investment partnership and emergency shelter grant programs. It works, even though some communities get more funding than others. It’s a good model, Ping said. If representatives from cities, township and the county helped develop a road project plan and agreed on priorities for any given year, that approach might work, Ping said. She supported bringing people to the table to explore this possibility. At the start of the March 1 meeting, Ken Schwartz – a former road commissioner who now serves as supervisor for Superior Township – noted that long-time road commissioner Fred Veigel was in very serious condition and had been moved to Arbor Hospice. Schwartz had received a phone call from Veigel’s daughter, encouraging people to visit him. “He wants to say his goodbyes,” Schwartz said. Alicia Ping (R-District 3) asked staff to send out an email letting other county commissioners know. Doug Fuller, chair of the road commission board, reported that he and WCRC managing director Roy Townsend had visited Veigel earlier in the week. He reported that the national council of the AFL-CIO held an emergency meeting and made Veigel chairman emeritus of the Huron Valley Central Labor Council. While Fuller and Townsend were visiting Veigel, members of the current Huron Valley Central Labor Council came and presented Veigel with a plaque that commemorated this honor, Fuller said. “It certainly cheered his day,” Fuller said. The day after this subcommittee meeting, on March 2, Veigel passed away. Visitation is scheduled for Saturday, March 8 from noon to 4 p.m. and 6-9 p.m., and on Sunday, March 9 from 11 a.m. to 3 p.m. and 5-8 p.m. at Nie Funeral Home on Liberty Road, just west of Wagner Road. Funeral services are scheduled for 11 a.m. on Monday, March 10 at the St. Nicholas Greek Orthodox Church, 3109 Scio Church Road. Have any other counties levied Act 283 millages in living memory? The Ypsilanti Community Utilities Authority(YCUA) surcharge for the City of Ypsilanti is for the payment of debt incurred for water and sewer projects not roads. Some of this work has been done in conjunction with road projects but not for the road work itself.